The phenomenon of the motorcycle hearse isn’t a new one. After all, we’ve mentioned them here at PopFi before, if only in passing. 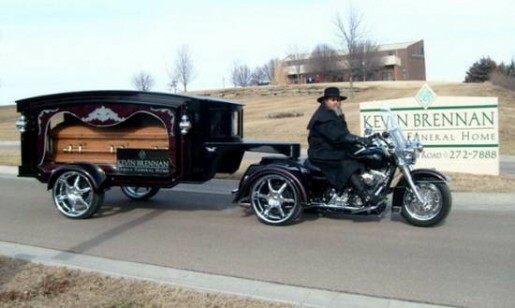 However, the motorcycle hearse isn’t a new phenomenon, and it’s not a random invention made for bikers by bikers looking to take that one last ride. The motorcycle hearse actually has a long and storied history, as this gallery of motorcycle hearses on Motorbike.org attests to! As long as there’s been motorcycles, there’s been a motorcycle hearse, either with a modified sidecar, pulling a caisson, or some combination of the two. The most interesting find in the gallery is a motorcycle hearse from World War II used to transport bodies back from the front. I can think of nothing more appropriate for an elaborate biker funeral than a motorcycle hearse; it’s like a traditional horse-drawn hearse, just slightly more modern.